Looking for a great outing for your Memorial weekend? Take a Saturday drive out to Sweet Home, Oregon and enjoy a sunny day of half marathon events honoring fallen hero Keaton Coffey. Cheer the runners coming in, fill your belly with good food–and ice cream–and, if you dare, challenge yourself to a few pull-ups on the outdoor bar. It’s a beautiful, lush green venue with a small-town feel, a silent auction, face painting for kids and more. For directions and details, go to 5th Annual Hero Half. It’s been five years since Keaton was killed in Afghanistan. In his honor, I’m posting this article from the three-year anniversary of his death. Never forget. A funny story came up at the memorial for my cousins’ son, Cpl. Keaton Coffey (US Marine Corps). Though the story is not related to surfboards, this picture (with Keaton clowning on the far right) best illustrates the mood. A fellow Marine, Keaton’s roommate, repeated it to the hundreds upon hundreds packed into the church that day to honor a fallen hero. It was about a time when the Marine had gone on leave one weekend, and when he came back, he said, he caught Keaton red-handed, eating his last piece of cake, a coveted slice he’d looked forward to. The Marine was incredulous and said something to the effect of, “Really, dude? You’re eating my cake?” And Keaton, his mouth full, simply replied, “But it tastes really good with milk.” The story struck a chord–for several reasons. It was a moment of levity amidst so much pain; it showed Keaton’s sense of humor, the dry wit that mirrors that of his dad, a former firefighter; but more than anything, how even the simplest moments can end up taking on so much meaning, becoming forever engrained in our memories. It’s hard to believe three (now five) years have passed since Keaton was killed, in Afghanistan, in the line of duty. He had so much to live for… just 22 years old… only two months shy of his wedding to Brittany Dygert… the only son, the only child of Grant and Inger Coffey. Keaton was so proud of what he’d accomplished as a Marine. It’s beyond painful, even now, to contemplate the loss, to those who loved him so deeply and to his country. I love this picture too, because it shows how much even his dog, Denny, adored him. Look at that paw stretched around Keaton’s shoulder! The pair were a team, trained to go first into danger to sniff out explosives and save countless other lives. But danger was everywhere in Afghanistan. As it turns out, it was a bullet and not an explosive that killed Keaton. Denny survived, and, thankfully, my cousin, Grant, Keaton’s dad, and his mom, Inger, have the option of taking Denny in his twilight years as their pet. The day Keaton was laid to rest whole communities lined the streets near Boring, Oregon, his hometown, for the procession. The sight of it and the throngs of Marines in uniform, veterans on motorcycles, firefighters and fire trucks at the funeral nearly brought me to my knees. Keaton was a beloved son, a source of pride, one of their own. But Keaton is also one of yours, in the end, whether you knew him or not, for he gave everything in service to you and this country. On this Memorial Day weekend, I’m glad you took a moment to read this and remember Keaton, and if you’d like to extend a hand in his memory, give to Wounded Warrior Project and/or Keaton’s Memorial Scholarship Fund. It’s been a rough year. My sister recently lost her husband, Craig Potts, father to their only son, Chris. And the pain is still raw. Craig’s death came just a few months after we lost our mother, Hazel: two dearly-loved souls passing in just three month’s time. Though we’ll always have fond memories of their personalities and the years spent together, it’s still difficult to believe that we’ll never see them again in this life. Both are endings that are hard to bear–and yet, what choice do we have? We take deep breaths and live one day at a time. Endings–and beginnings–are on my mind. Just this morning, I took my daughter to the airport for a flight to her junior year in college. And later today, my son and his friend, who boarded in our home during an internship, will pack up and leave the house to drive south into their senior year of college. It will be quiet around here without their comings and goings; the washer and dryer will get a rest, and the meals I cook will shrink again to portions for two: my husband and me. Yet every ending is a beginning: the beginning of life without the ones we’ve lost, the beginning of new adventures and relationships, of news from children and friends, of chapters we’ll add to our own lives. A while ago, as I sat writing this, the high school bus stopped on the street outside to take this year’s students–no doubt some new–off to their second week of classes. While beginnings are hopeful, they aren’t often easy, obscured as they are with distractions of the unknown: What challenges will come? Will the good times outweigh the hardships? You can try to live right, make lists, load up your phone calendar, invest in the latest technology, you can plan and you can pray, but nobody’s ever going to develop an app that shows you the future. As for me and my writing endeavors, I start the new season with a plenty of unknowns. 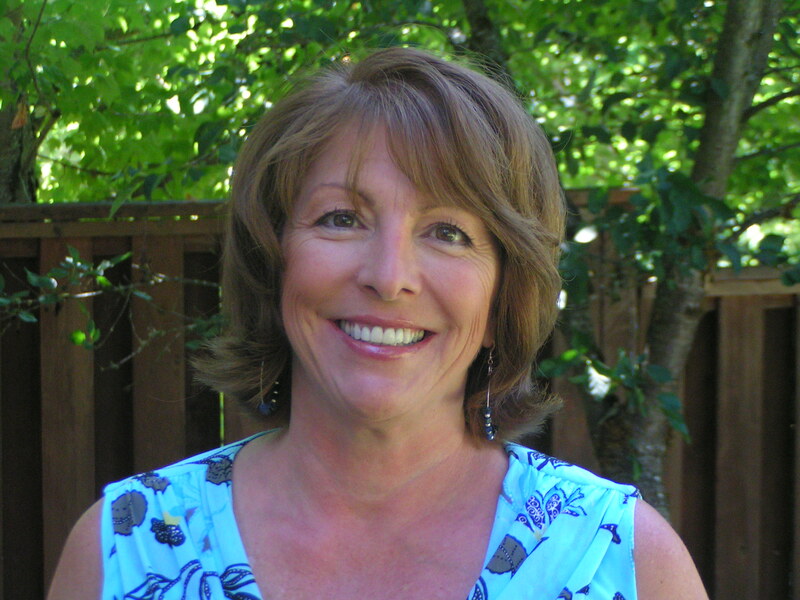 I recently invested time interviewing with literary agents. It went well, though I’m still waiting for something concrete. Meanwhile, I continue to work on my second novel–talk about beginnings and endings. My goal is to finish it by the end of the year, and I wonder: Will I get there? Will it be what I envisioned? If only there was an app for that. Outside, the summer is coming to a close, my days of writing on the patio numbered for the year. The high in Portland will climb past 80 today, but the morning was brisk, and the trees, already tinged with red, tell us what’s coming. I’ve combed through internet book sites and read dozens of reviews of recently released books to come up with the following list for summer reading. These are books that I would like to read based on online descriptions and, particularly, reviews from actual readers. What I’ve found in recent years, is that you get the best reviews not from book jackets or professional writers, but from real people, lots of them, who’ve taken the time to leave comments online that are sometimes pithy, sometimes eloquent but, as a whole (and given enough reviews), brutally honest. It was no surprise to me that what I ended up with was a list of books with Amazon ratings of 4 &1/2 to 5 stars. What was a surprise is the number of books this year I ended up choosing that are nonfiction. I found only two recently-released works of fiction I would like to put on this list, and I’ll begin with those. Happy reading! I’m leading with Learning to Swear in America, by Katie Kennedy, because I love the premise and its everyday reviewers are calling it funny, delightful, touching, intelligent, charming and streams of other positive words. It’s actually a Young Adult crossover, science-based story about a Russian teenager come to America to help stop a deadly asteroid hurtling toward southern California. The boy genius and protagonist, Yuri, has to work with a group of mostly older men, thus the title, Learning to Swear in America. The book is just out, so not a ton of reviews yet, but so far, it’s chalking up raves and 5 stars. Next is A Hundred Thousand Worlds: A Novel, by Bob Proehl. While I’m not a comic book fan, I’m intrigued by this coming of age story about a boy and his mom traveling cross-country (with a couple of friends) to various comic-cons. What better way to see superheroes than through the eyes of a child? By all accounts, it is well-written, and, ultimately, a story of endearing love between a mother and son. Grunt: The Curious Science of Humans at War, by Mary Roach, is a wry look at attempts to tackle the unusual challenges military soldiers face, and already the book is a best seller. There are chapters on everything from hearing to heat, diarrhea to genital transplants, even one about repeated attempts to develop a shark repellent. Roach, the author of several other books, is adept at researching odd topics and delivering the information with her signature brand of dry humor. The Gene: An Intimate History, by Siddhartha Mukherjee is another early best seller, a readable biography/history of those tiny yet all-important bits of information in DNA that make us unique. The book begins with Mukherjee’s own family history of mental illness and explores deep questions, including, If we manipulate genetics to eliminate issues, will we also end up changing who we are? There are so many implications—and possibilities. By telling a story with what is described as a beautiful narrative, Mukherjee moves past what might otherwise be a tedious look at DNA to create an intriguing biography of the microscopic yet miraculous gene. Switched On: A Memoir of Brain Change and Emotional Awakening, by John Elder Robison is yet another science-related release (can you tell I love science?) More specifically, this is a memoir of Robison’s awakening from autism syndrome after brain treatments that allow him, for the very first time, to fully recognize and experience emotion. Robison’s response to the treatments, while not universal, provides hope for others living with autism. Reviewers say the memoir reads like a medical thriller, leaving you anxious to learn what the next treatment will bring. I hope you find these books of interest. Since they are new releases, they’re primarily available electronically or in hardcover, though not yet in paperback. If you’d like to recommend something you’ve enjoyed or can’t wait to read, leave a comment below, and may the rest of your summer be filled with many relaxing moments lost in a book. Gillian Flynn, the author of Gone Girl, once said that she had yet to see a reader enjoying her novel out “in the wild,” but that she’d love nothing more than to be able to “tap someone on the shoulder and say, you know, how are you liking the book?” I second that! While I haven’t seen my book “in the wild” either, I have had a few close calls, the closest just last week: my husband, Ed, on the train home from work. He noticed a woman nearby cradling a book. Nothing unusual there, of course, until he saw the title: The God of Sno Cone Blue! Immediately following, he sent me a “Guess what?” text. Wait–no, I take that back, he texted the whole family, our two kids included: “The God of Sno Cone Blue is right next to me on train(!) A woman is reading it(! )” The exclamation points are mine. No idea why Ed left them out. Naturally, I couldn’t let a moment like that pass: only a few colorless words on my cell phone screen? “Take a picture of it, by golly!” I texted back. Poor Ed. (And, yes, I really did text “by golly!”) Then I added: “Ask her how she heard about it and tell her you’re my husband!” Again, poor Ed. And poor woman! Ed did take the picture, as you can see from the image above. Turns out my dear reader was a good sport and, I might add, has very good taste in books. A few days later, she sent a note to my Contact page identifying herself as the woman on the train and saying not only had she finished the book, but she “loved it!” Her exclamation point, not mine. It was, in the end, a very fine point on a very fine moment. While I’m at it, I’d like to highlight another recent Sno Cone Blue siting, though it didn’t come, as they say, out of the blue. It happened at a literary event for Community Partners for Affordable Housing (CPAH) when I had the honor of joining eleven other Portland-area authors at a book signing and auction at the Oregon Zoo. 18 years in the running, the event celebrates local authors while raising funds to help alleviate our local housing crisis. Portland’s own Sheila Hamilton, All the Things We Never Knew, was the featured speaker, along with Mitchell S. Jackson, The Residue Years. We all sold stacks of books, got a chance to talk to avid readers, and watched CPAH race past its fundraising goal, which was really fun to witness. The Portland Society Page even posted an article on the event which you can read here. I saw many copies of Sno Cone Blue roaming the auction that night, and a few cracked open, but, alas, I can’t quite call that “in the wild,” even if it was at the zoo. Finally, here’s a list, with links, of the other Portland-area authors at the HomeWord Bound event. I’m sure they’d love for you to check out their books. Happy reading! David Banis & Hunter Shobe, Arthur Bradford, Valerie Geary, April Henry, Bart King, Margaret Malone, Liz Prato, Ellen Urbani, Ruth Wariner. Imagine you open your mailbox, and inside, among the coupons and bills and glossy fliers is an envelope addressed to you. Not only is your name front and center, it’s written in trailing ink, with the subtle flaws of actual handwriting. The envelope is thin, but weighty enough, and you recognize the return address instantly: a friend, maybe a lover, or maybe an enemy. The rest of your mail suddenly can wait—the rest of the world can wait, for you’ve just gotten a letter, and nothing is more important than tearing it open to read it. I love letters, even if, in this digital age, they’re a dying art. What could be more personal and heartfelt, than a beautifully-crafted handwritten letter? I love the thought of them, the look of them, the feel and even the smell of them, not unlike the smell of a book. Which is probably why I chose letters as a vehicle for my first novel, The God of Sno Cone Blue. (The second novel is coming along well, by the way, though never as fast as I’d like.) Those of you who’ve read my first book know that my main character Grace receives letters written by her mother before she died. I guess I always knew the mother’s story would be a source of mystery and interest, but I never anticipated just how much. The main comment I get from readers? “I can’t wait to read the next letter!” And yes, I get it. Oddly, letters aren’t as common in literary fiction as you might expect. Epistolary novels that come to mind include: Dracula (Bram Stoker, 1897), The Screwtape Letters (C.S. Lewis, 1942), Up the Down Staircase (Bel Kaufman, 1965), The Color Purple (Alice Walker, 1982), The Perks of Being a Wallflower (Stephen Chbosky, 1999), and The Guernsey Literary and Potato Peel Pie Society (Mary Ann Shaffer and Annie Barrows, 2008) to name a few. Few of us bother with handwritten letters anymore. I’m as guilty as anyone. The most I write by hand these days is a list of to-do’s, a phone message or a miles-long grocery list. Today we use laptops, phones, email and text, which hardly come close. Scant effort in, brings scant reward: What time you off work? Five—you? Five-thirty. K, what’s for dinner? I thawed a chicken. K, see you then. Yet we know there’s no turning back. We’re out of practice—and patience. And we love the convenience technology brings. Even now, if I’m sending a letter the “snail mail” way by US post, I type it up, to spare my fingers, and print it out. Did I just admit that? Yes, I did. But I’d like the think there’s still a place for handwritten letters, where the effort we put in truly counts. What if, as in my novel, we wrote missives to the people especially dear to us, to be opened after we’re gone? What better way to say I love you than I cared enough to put pen to paper, recount these memories, express these sentiments, in my very own handwriting, just for you? It sure beats an email. Do you shop at your local bookstore? If you want to support local businesses, it’s the way to go. I’m pleased to say that my novel is now in Annie Bloom’s, a beautiful, independent bookstore in Portland’s Multnomah Village. It’s a small victory for self-published authors like myself to get their books on bookstore shelves. The publishing world has been turned on its ear by the digital age of online shopping, not to mention self and indie publishing–all of which makes it more challenging for ‘brick and mortar’ bookstores to thrive. So, if you haven’t been to Annie Bloom’s or your local bookstore in a while, pay them a visit. You’ll find something you love and gain the satisfaction of supporting commerce in your own neighborhood. Writing, like many endeavors, always takes longer than you anticipate. You know that dinner recipe that promised a preparation time of 20 minutes, then really took 40–or 60? That’s what writing feels like. I’m in love with the story of my second novel, and the chapters are falling into place–If only I could get them to fall faster! Alas, one of these days I will finish that final scene. In the meantime, small victories with Sno Cone Blue keep me inspired. More than a hundred reviews on Amazon so far give it an overall rating of 5 stars. And the novel continues to be a favorite with book clubs. Hard to believe, but I’ve had the pleasure of making more than 50 author visits to book clubs to date, and I continue scheduling them. Somehow we always manage to have a blast. Wine, women and great conversation–what’s not to like? If you’re interested in scheduling an author visit (or Skype for long distance), drop me a line on my Contact page. I’d love to hear from you! Back to bookstores for a moment and one more small victory. For my readers who are local, I’m the featured author at Jan’s Paperbacks in the Aloha/Beaverton area this month. On Saturday, February 27th, I’ll be signing copies and chatting with readers from 11am to 2pm. I’d love it if you could stop by. Come get a signed copy for less than the online price. Bring a friend–or a whole book club! Word of mouth here, a thumbs up there, either globally or from one street to the next, that’s basically what I mean by It takes a neighborhood to raise an author. My latest example? 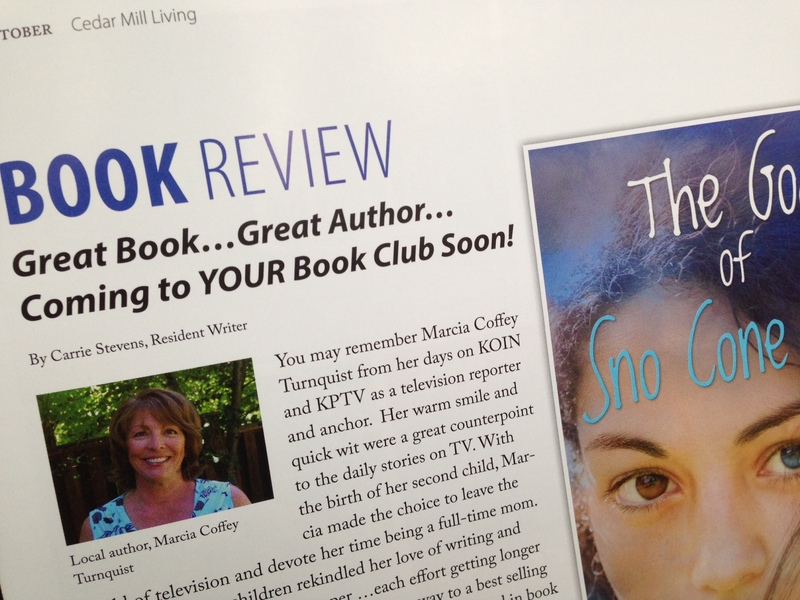 A full page review saying, “The God of Sno Cone Blue will tickle your funny bone, exercise your love for twist and turn mysteries and cause your mind to race with questions….” It’s written in Cedar Mill Living, a publication with a small but focused audience–and I’m thrilled. This is how word spreads about a good book: from reader to reader, publication to publication, and book club to book club. Because I’m self-published I’ve had multiple doors slammed on me–figurative doors, yes, but nevertheless, slammed hard all the same; if they’d been doors of solid wood, I’d look like a boxer after a 10th round knock out. This is despite the fact that self-publishing is the future of publishing. The good news is, there are other doors in this ever-expanding neighborhood of mine that keep flying open to reveal excited readers. And my readers never cease to amaze me with their questions and insights. Believe me, no two book clubs are alike, nor do they operate the same way. I continue scheduling, so drop me a line on my Contact page if you’re interested in an author visit. If you’re near Portland, I’m happy to come in person or, if not, I Skype for long distances. The novel continues landing excellent reviews. 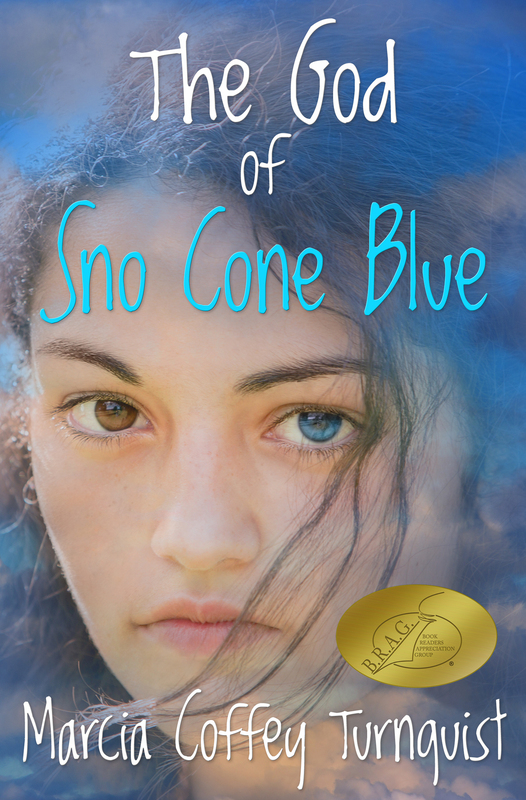 Besides the latest endorsements in print, Sno Cone Blue is fast approaching 100 reviews from readers on Amazon. The vast majority (83 percent) rate it 5-star and the remainder, 4-star, which is awesome. Based on the comments you’ll see there, readers are moved by the story, appreciate the depth of the characters and, best of all, don’t anticipate the twist at the end. For Sno Cone Blue, I expect doors to keep opening… In the meantime, I’m staying busy with novel number two, progressing chapter by chapter as I look ahead to estimate editing and publishing dates. In fact, I just finished a shoot for a promotional video you’ll see down the road, probably in spring. Mum’s the word at this point what it will look like, but suffice it to say you’ll get a good laugh out of it–at my expense! Hints are buried in the novel’s subject matter and description of its heroine, a skilled cliff climber. The next novel will be called Skipping the Light, and it’s a new genre for me: Dystopian society in the vein of Hunger Games, with the added twist of time travel–yes!–written for Young Adults with Adult crossover. How’s that for a change from a mother-daughter novel?! Not to mention it will be the first in a trilogy to keep me–and readers–busy for years to come. I’m excited and passionate about the story, so stay tuned for news on the new book as the chapters add up. Thanks for being a part of my neighborhood, and drop by again soon.